Spotted: Us on the cover of the Wall Street Journal! Holy sh*t! What a start to the day! Our efforts to not only support the term, but promote the double denim look, a.k.a. 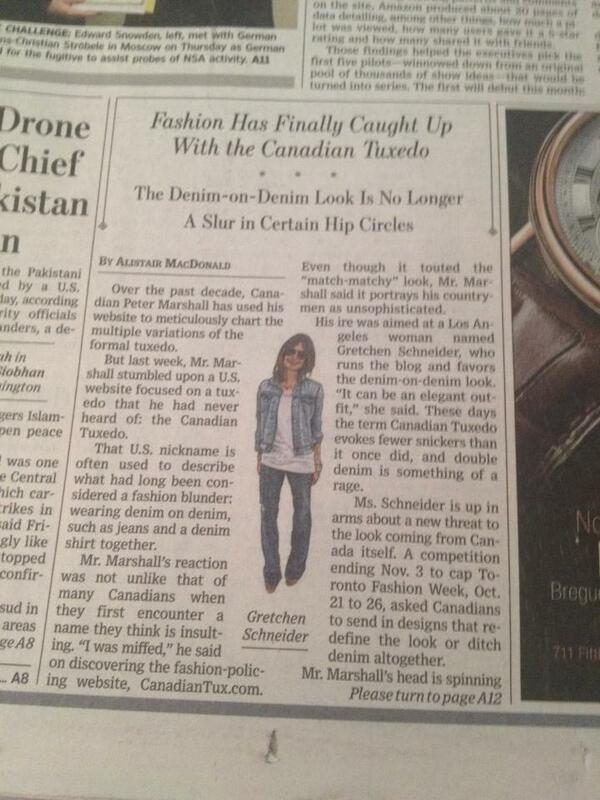 the Canadian Tuxedo, have hit all new highs as we found ourselves on the cover of the Wall Street Journal today! Team Tux thinks this look is amazing. And elegant. Chanel even makes Canadian Tuxedos (Thank you Uncle Karl). Let us know what you think and have a great weekend! This entry was posted on Saturday, November 2nd, 2013 at 9:59 am	and tagged with Canada, Canadian Tuxedo, Chanel, Denim, Denim on Denim, double denim, Fashion, Gretchen Schneider, Jeans, Karl Lagerfeld, Los Angeles, Wall Street Journal and posted in Press. You can follow any responses to this entry through the RSS 2.0 feed. Who is the hack that wrote this article?